Thank you for visiting our website. If you are a Landscape Contractor, Garden Designer, Grounds Manager, Municipality or interested in quality flowerbulbs for any other reason, you have come to the right place. 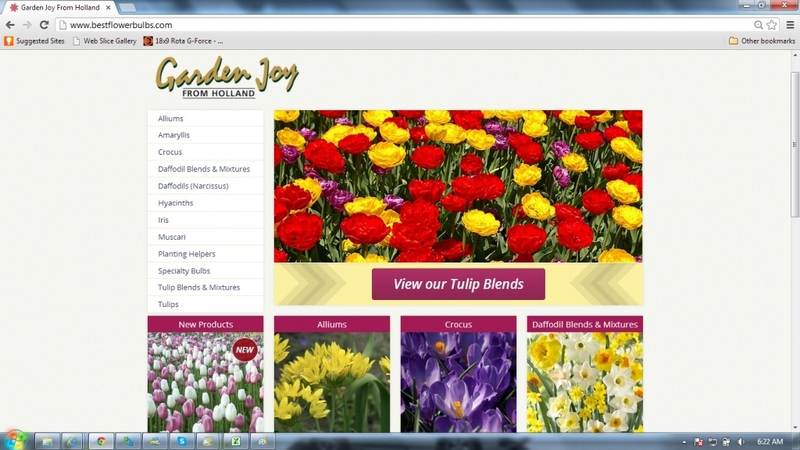 At De Vroomen Garden Products we are dedicated to supplying you with the best possible flowerbulbs. The De Vroomen Garden Joy landscape program consists of 250+ carefully selected varieties. Tulips and Daffodils are by far the most popular varieties in our landscape line-up, but at De Vroomen Garden Products we also offer a large variety of specialty bulbs. Varieties like Alliums, Scilla’s and Fritillaria’s are becoming more popular because they will offer your customers a special and different landscape display. Please contact us with any special requests for items that are not listed in our catalog. We will be glad to source the varieties that you need. Throughout the year our product development team spends a great deal of time creating beautiful blends which De Vroomen Garden Products is known for. We plant combinations in our test garden or in our Keukenhof garden to see what varieties complement eachother. The success rate of a blend depends on the height, bloom time, color scheme and trends in gardening. In our state of the art production facility, we can blend up to 8 varieties and create an accurate counted mixture. In addition to our program of De Vroomen blends, we also offer the service of blending any of our varieties in the catalog free of charge. This service is only available for deliveries from our Russell inventory. We have a blend machine in our distribution facility in Russell that allows us to blend any varieties throughout the season. Have you seen a perfect blend, let your salesperson or our customer service staff know and we will create it for you. We might even add your blend to our catalog! We offer our bulbs in different sizes but overall we focus on bigger, premium bulbs. The bigger the bulb, the better the result and at De Vroomen, quality comes first. 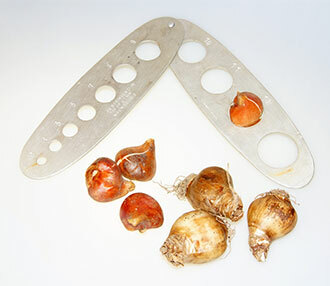 Bulbs are measured by their circumference in centimeters. 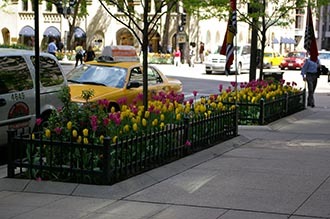 For instance a bag of 12/+ cm Tulips consists of bulbs with a circumference of 12 cm or larger. XXL bulbs will give XXL blooms and will make a guaranteed impression. We will continue to source the market for additional giant varieties. Our landscape program begins shipping in early September. The first possible delivery date is around September 15th. You are welcome to place your orders early in the year to make sure the varieties you requested are available. 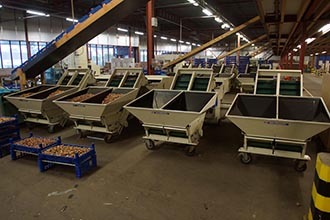 These orders are packed in our production facility in Lisse, Holland. Throughout the landscape season we maintain a stock in our distribution center in Gurnee, IL, for direct shipping. On our website www.devroomen.com we list the current availability which is updated daily. All our bulbs are shipped in sturdy boxes or black plastic shipper crates. We have two distribution points in the USA, Newark, NJ or Gurness, IL. You can either pick up your order there or have it shipped to your front door. Larger orders are regularly shipped on pallets. Smaller orders or re-orders are shipped by UPS. We can pack your orders by job name. Just send in a PO per project and you will receive your bulbs packed accordingly. This will save you a lot of time and money sorting out your delivery. We pack our bulbs in mesh landscape bags that have a handle. Each bag has the variety, size and amount of bulbs imprinted. We also register the production process which allows us to track each bag of bulbs back to the grower; a valuable instrument to increase quality year after year. Each delivery comes with a detailed packing list. All our landscape bags have an imprinted QR code that will link to our Garden Joy Landscape Flower Bulb website. By scanning this QR code with a mobile device you, or your customer, can retrieve product information, pictures and planting information. 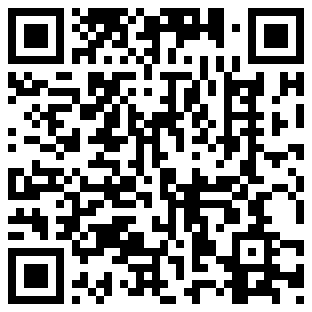 Give it a try and scan the QR code below. This will also allow you or your customer to explore the whole Garden Joy Landscape Flower Bulb program on your mobile device. 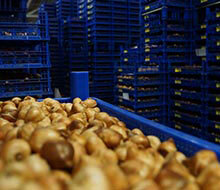 At De Vroomen we are trying to help our customers improve their flowerbulb business in any way possible. 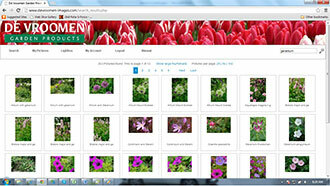 We designed three new tools that will help you as a landscape professional to re-sell De Vroomen flowerbulbs. One of them is a 6 page flyer that contains our top 100 best-selling varieties. It is ideal for customers that require less choice or if you want to keep your program focused. We also have a two-sided order form available that you can personalize and use for order intake. If you would like to receive these flyers, feel free to contact our customer service at 847-395-9911. Another exclusive tool is our online ‘Garden Joy Gallery’ picture database. This online database contains all high resolution photo material that is currently owned by De Vroomen. For our customers, these pictures are available to use on your website or in your catalog. You can easily browse the database and select the pictures you would like to receive. Request a login here.